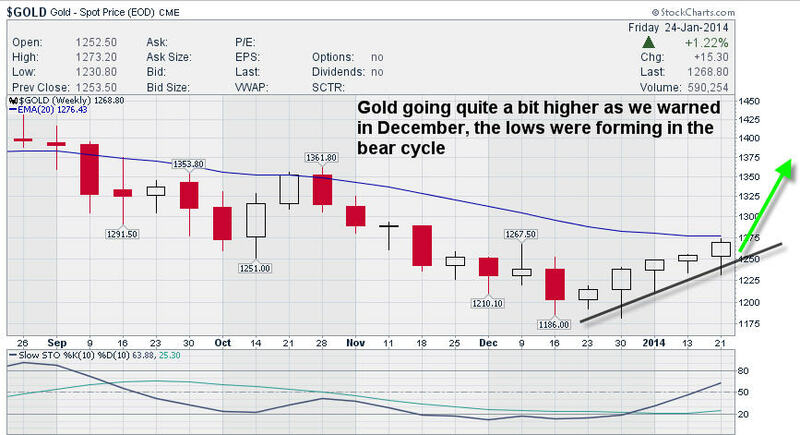 “These types of indicators are coming to a pivot point where Gold is testing the summer 1181 lows…at the same time, we see bottoming 5th wave patterns combining with public sentiment, bullish percent indexes, and 5 year lows in Gold stocks. This is how bottom in Bear cycles form and you are witnessing the makings of a huge bottom between now and early February 2014 if we are right. A few suggestions that we have already written about we will reiterate here again. Aggressive investors can look at UGLD ETF, which is a 3x long Gold product that will give you upside leverage as Gold moves into elliott wave 3 up. Other more aggressive plays we already recommend a lot lower include GLDX, JNUG, NUGT and others. Picking individual stocks can be even better and we have recommended a few to our subscribers that are already doing very well.